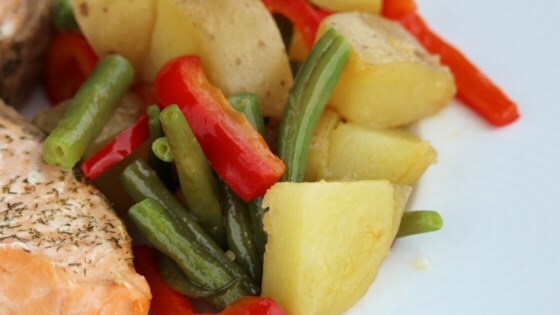 "Delicious salad of green beans, potatoes, red peppers, and goat cheese goes perfectly with chicken or pork. Experiment with other potato types such as purple and other soft cheeses, such as garlic and herb." Place the potatoes into a large pot and cover with salted water. Bring to a boil over high heat, then reduce heat to medium-low, cover, and simmer until tender, 8 to 10 minutes. Drain and allow to steam dry for a minute or two. Place potatoes in a large bowl. Heat a large skillet over medium-high heat; grease with cooking spray. Cook and stir the green beans and onion until tender, about 5 minutes. Stir in the garlic; cook and stir until garlic is fragrant, about 1 minute more. Transfer the green bean mixture into the large bowl with the potatoes. Add the balsamic vinaigrette, roasted red peppers, and basil; toss lightly. Stir in the goat cheese. Good dish and will make again. I used fresh red pepper and added in the skillet with the onions. I also used 1/8 cup dry basil and added that with the garlic. Thanks! I didn't care for this, but my boyfriend loved it. I thought the balsamic vinaigrette overpowered everything.